It is an unmistakable species for it shape and aspect. In the late summer for the high and characteristic inflorescence, in the other seasons for the above-ground bulbs and leaves. Habitat: It is found in open spaces in sandy or gravely soil and on limestone cliffs, often under very harsh conditions, with the bulbs totally above the ground. 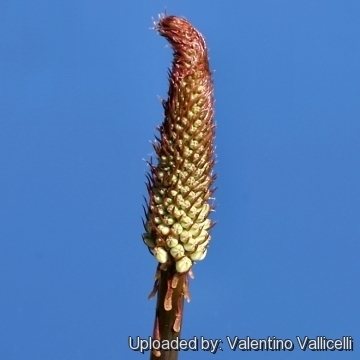 It grows close to the sea or by far more commonly inland than on the sea, at an elevation range of 0-600 meters. 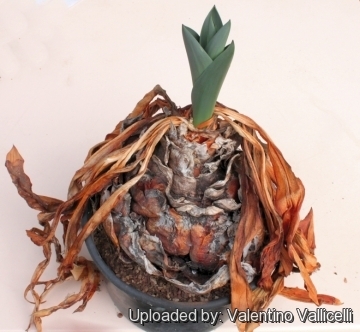 The bulb resist to the occasional fires common in the Mediterranean area, and fires don't harm them at all. Ornithogalum anthericoides (Poir.) Link ex Steud. Squilla anthericoides (Poir.) Jord. & Fourr. Squilla insularis Jord. & Fourr. Urginea maritima subs. insularis (Jord. & Fourr.) K.Richt. Squilla littoralis Jord. & Fourr. 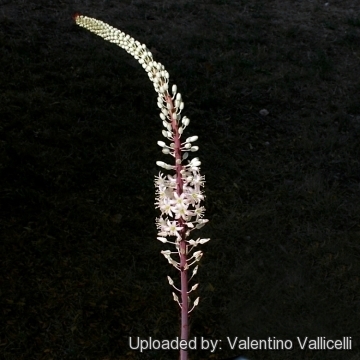 Urginea maritima subs. littoralis (Jord. & Fourr.) K.Richt. Squilla sphaeroidea Jord. & Fourr. 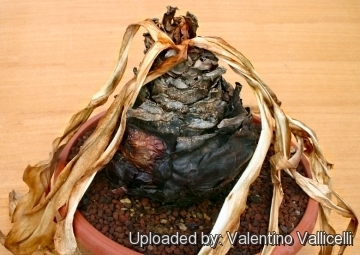 Description: It is the giant among all Mediterranean geophytes it is a winter active perennial bulb. The plant is not fragrant even in the flowers..
Bulb: Pyriform with several layers of papery tunics that protect the bulbs from the sun. 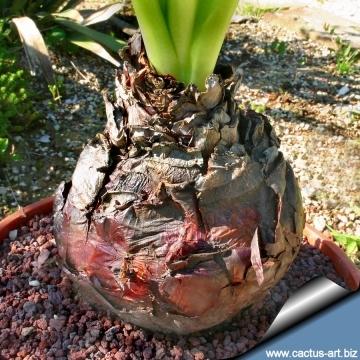 The bulbs split dichotomously from the apex rather than forming basal offsets and in time they grow to massive clumps up to 20 heads, each one from 12 to 20cm in diameter and weigh 2 to 3,5 kg. The form with brown reddish outer tunics, is sometime referred as var. rubra and gets to be a bigger size. The other form has whitish outer tunics and is referred as var. alba. The big bulbs can last for dozen of years. Leaves: Broadly sword-shaped, erect, coriaceous, slightly succulent, dark green with a bluish waxy bloom that can get up to 35cm long by 10cm wide. The leaf canopy will reach about 60-90cm tall by 60-90cm across. They are basal and emerge in autumn and last till in spring. Roots: The root system is extensive. The roots are few and quite succulent. 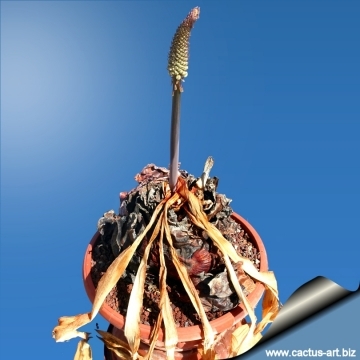 Cultivation and Propagation: Easy to grown in a dry and sunny position or under a deciduous tree so the plants will receive winter sun, it can be grown in the ground (in warm climate) or in a decorative pot. The bulbs are winter active and summer dormant, so they should be given supplemental water in the winter, but none in the summer. The bulbs can be planted lifted to expose the top one half. When planting in the ground allow ample room for the bulbs to divide and multiply. Plant in a porous soil with good drainage. 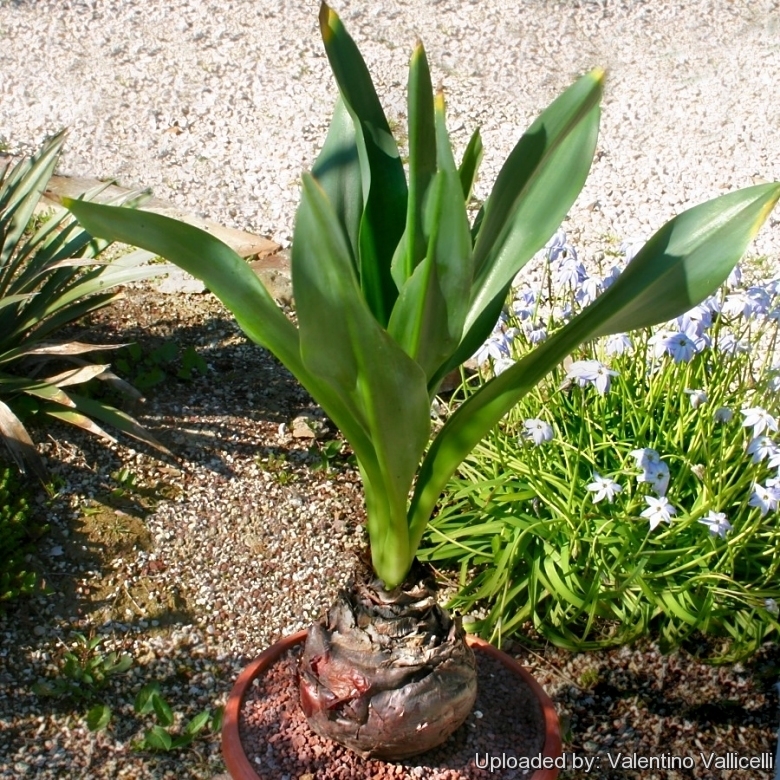 The foliage is hardy to at least 3° C, while the bulb itself can tolerate lower temperatures. 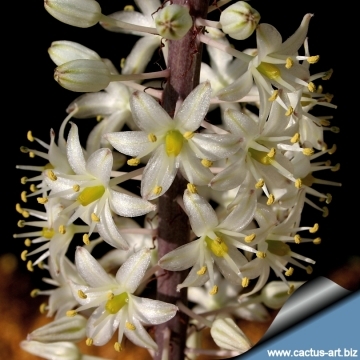 Urginea maritima can be grown in a cactus and succulent garden. 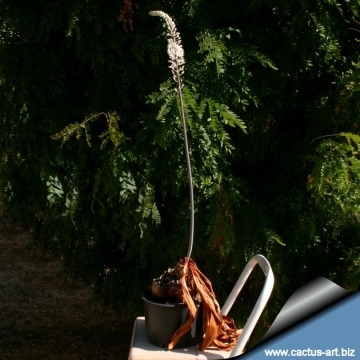 It can be placed in a decorative pot and used as a winter focal point on a patio. Delicate flowers bloom in summer and the tall stalks dot the landscape creating a beautiful sight. This species has the same growing cycle of many winter rainfall South African species likeAmaryllis orBrunsvigia, but foliage resembles the foliage of Mexican Agaves. Uses: Poisonous plant. Rodents don't eat the bulbs since they are poisonous. Repellent and anti-parasitic agent for insect and mice. The farmers put the whole plant in granaries and silos.